A group of nuns who went missing in Syria after Islamist fighters captured a Christian village this week have appeared in a video, saying they are in good health and denying that they had been kidnapped. 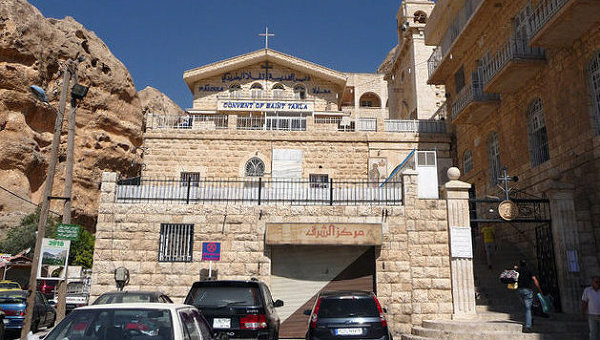 The nuns were taken after militants seized the ancient quarter of Maaloula, a Christian village north ofDamascus, following heavy fighting with President Bashar al-Assad’s forces on Monday. The fighters then moved the nuns from the Greek Orthodox monastery of Mar Thecla to the nearby town of Yabrud, according to the Vatican’s envoy to Syria. In the video broadcast by Al Jazeera late on Friday, more than a dozen nuns wearing long black robes appeared sitting on couches around a room. Asked by a man behind the camera if they had been kidnapped, one denied it and said they had only left the monastery to escape the shelling, and that they would be released after two days. “We are being treated well. They brought us from the convent, out from under the shelling … they rescued us, and we’re very happy with them,” another nun said. It was not clear when or where the video was filmed or under what conditions the nuns were speaking. On Friday, the pan-Arab Asharq al-Awsat newspaper reported that a rebel group calling itself “Free Qalamoun” had claimed the kidnapping of the nuns and wanted to trade them for a thousand female detainees held by the government. Syria’s Christian minority has generally tried to keep on the sidelines of the civil war, which pits mostly Sunni Muslim rebels against Assad, who is from the minority Alawite sect, and his foreign Shi’ite allies. But many have been alarmed by the ascendance of hardline Islamists among the rebels, including some factions linked to al Qaeda.